Remember the original Splatterhouse? I do, it was a thing of wonder and beauty to me. I pored over images in my imported copy of EGM (hey, that was exotic to a 9 year old Londoner) and dreamed of saving my pocket money for the next ten thousand years so I could afford a TurboGrafx to play it on. My interest in the game had nothing to do with gameplay, I just wanted it because it was gory. Like puddles of blood, blood-explosion, missing bloody body parts ultra-gore. It was like an 8-bit abattoir. But, sigh, I never got my hands on it. Thankfully, 20 years later, Splatterhouse is being remade and it’s staying true to the spirit of the original. 1UP are carrying an interview with developers BottleRocket and it’s enough to put a big cheesy grin on the face of grown up-children everywhere. 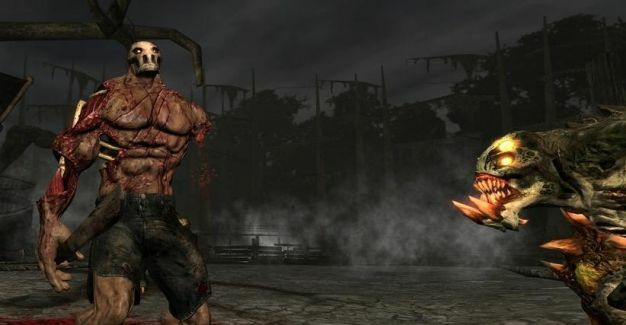 “The player has to get a charge out the game, and we want people to be able to dump some stress after a long day,” said Lead Designer Mark Brown of Splatterhouse ‘s qualities. “Gore, while not being critical to the genre, is what our game is going to be all about. When you kill something, it will not just die. It will be obliterated from the face of the earth in a very over-the-top fashion.” Hee hee! Just making players go “ewwwww, awesome!” isn’t enough for BottleRocket though. When quizzed on the puke-quota of this game compared to previous entries in the series, Brown expressed his desire to elicit a more, er, physical reaction. “I would say there’ll be more vomit, but not in-game. The vomit will be coming from triggering gag reflexes in gamers!” Excellent. Splatterhouse is slated for release later this year.